Discovering means finding out new information, gaining knowledge of the previously unknown and furthering and deepening the exploration of something important. 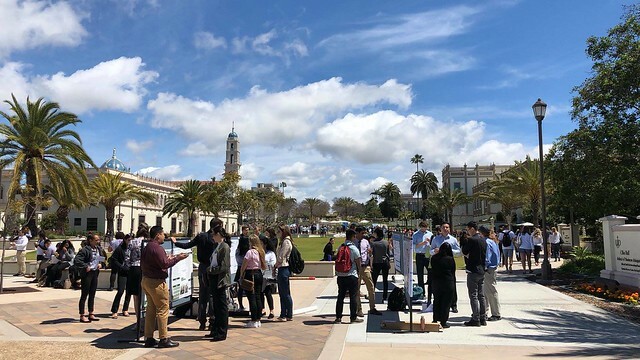 The past seven days at the University of San Diego, April 5-6 and again April 8-12, consisted of observation, demonstration and celebration of discovery through multiple events that connected to comprise the university’s fourth annual Research Week. The week, co-hosted by the Office of the Provost and the Office of Sponsored Programs, brought to light one of the university’s strongest hallmarks of a liberal arts education in the Catholic intellectual tradition. Research, done by both high-quality faculty members and outstanding students, is a changemaking activity. Praise is also given to faculty, staff and administrators who seek external funding, who provide opportunities for students in their lab and outside the classroom and top-notch mentoring so that students gain confidence, knowledge and a love for research in their respectively subject areas. Mathematics Professor Perla Myers, PhD, took participants “on a mathematical exploration journey to discover something beautiful.” Those who participated learned about the connection between math and folding paper, making Origami objects in Salomon Hall before concluding the day with a campus-wide math scavenger hunt. The university’s Department of Biology hosted a one-day conference at the Shiley Center for Science and Technology and at the outdoor Paseo de Colachis. The event featured oral and poster presentations by undergraduate students from colleges and universities in the western United States. Students, including those from USD, presented their original data generated in biology and related fields. The eight USD students who comprise the 2018-19 Keck Humanities Fellows cohort — Sophie Abber (Behavioral Neuroscience/Anthropology), Kayla Beauregard (Philosophy), Emma Dickson (Theatre Arts/Math), Rebecca Lancaster (International Business), DeZell Lathon (Theatre Arts), Jordan Matuszewski (Computer Science/Math), Nikta Shahbaz (Interdisciplinary Humanities) and Amber Sheldon (Philosophy) — discussed their positive and challenging experiences while working on a year-long independent research project with a faculty mentor and their insights on the program, which is in its second year at USD. One Keck Fellow, Rebecca Lancaster, will have a pop-up exhibit, “Jesus Died on Death Row,” which is connected to her research project on Wednesday, April 17 from 9 a.m. to 5 p.m. in the Humanities Center. This one-day exhibit looks at U.S. capital punishment and its roots in Catholicism. It asks why the men who brought Christianity with them to the Americas also brought the death penalty and looks at what death row looks like nowadays. All of the Keck Humanities Fellows — and Interdisciplinary Humanities majors — will present their research projects Wednesday, May 1 beginning at 5:30 p.m. in the Humanities Center. Gail F. Baker, PhD, vice president and provost, and the Office of Sponsored Programs co-hosted a wine and cheese reception and honored USD faculty and staff for submitting grant proposals during the year. Four faculty members were honored for securing unique accolades tied to their field subjects: Assistant Professor of English, Malachi Black, PhD, MFA, recipient of a National Endowment for the Arts Fellowship; Associate Professor of History Thomas Barton, PhD, National Endowment for the Humanities Research Grant; Assistant Professor of Ethnic Studies Josen Diaz, PhD, has been the 2018-19 Visiting Fellow with the Asian-American Studies Center and the Institute of American Cultures at UCLA; and Assistant Professor of Physics Ryan McGorty, PhD, was selected as a 2019 Cottrell Scholar Award winner. Three faculty members were recognized with certificates for being first-time submitters for external funding: Assistant Professor of Visual Arts Farrah Karapetian, MFA; Assistant Professor of Mechanical Engineering Melissa Gibbons, PhD; and Martha Fuller, PhD, Associate Professor of Nursing in Nurse Practitioner and Doctor of Nursing Practice programs. Four more were honored as new members of the USD OSP Million Dollar Club — those who’ve accumulated at least $1 million in external funding — Administrative Director of the USD School of Law Legal Clinics, Eric Austin, JD; Associate Director of the Nonprofit Institute and Professor of Practice in SOLES’ Department of Leadership Studies, Laura Deitrick, PhD; Director of Research for the Caster Center in The Nonprofit Institute, Mary Jo Schumann, PhD; and Physics Professor Greg Severn, PhD. The Keck Foundation-sponsored USD Office of Undergraduate Research hosted its annual honoring of faculty members who’ve excelled as mentors for students in the lab and with research in their fields of study. This year, OUR presented three faculty with awards. Each award recipient — Professor of Mathematics Lukasz Pruski, PhD; Assistant Professor of Psychological Sciences (Behavioral Neuroscience) Jena Hales, PhD; and Assistant Professor of Physics Ryan McGorty, PhD — was honored in the best possible way. Each award winner received their honor after listening to the lavish praise from the students they’ve supported, questioned, nudged and inspired to do the research work. Pruski was feted by student mentees Elizabeth Kresock ‘20 and Kiley Sprigg ’19; Hales was celebrated by Nina Tabrizi ’20; and McGorty’s student speakers were Michelle Wang ’20; Christelle Matsuda ’19, and 2018 alumna Devynn Wulstein. A sampling of Shiley-Marcos School of Engineering senior capstone project posters was on display in the Belanich Engineering Center’s Ideation Space for students to present and showcase their research work. One of the most interesting is a collection of multiple water-treatment projects done by students in Mechanical Engineering Professor Frank Jacobitz’s course. USD students partnered with Azrieli College of Engineering students in Jerusalem and their faculty member Yaal Lester on the research projects. The USD students visited Israel earlier this year to secure water samples for research purposes. The Humanities Center has hosted a semester-long focus on truth and it is part of a three-semester series inspired by a quote attributed to university co-founder Mother Rosalie Hill about education at USD: "Beauty will attract them, goodness will lead them, but the truth will hold them." The Humanities Center has hosted semester-long looks at beauty and goodness in Spring 2018 and Fall 2018, respectively. This particular entry was on truth and lies in politics. A three-faculty panel consisted of discussions by Pat Drinan, PhD, and Tim McCarty, PhD from the Department of Political Science and International Relations and Michael Gonzalez, PhD, from the Department of History. There are still a few more events in the Truth series: April 30 and May 7. 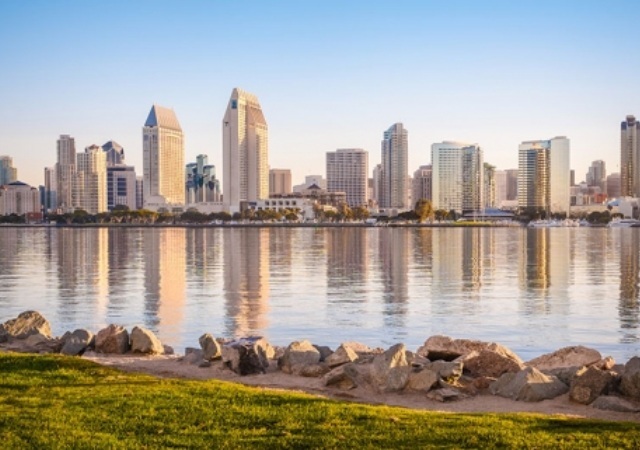 The TRIO Takeover gave students in USD’s TRIO Upward Bound, TRIO Student Support Services and TRIO McNair Scholars programs the chance to present their research to a roving audience on a lab crawl format. Beginning with poster presentations by TRIO Upward Bound students from Kearny High School in the Shiley Center for Science and Technology Atrium, there were also research presentations by USD TRIO students in the SCST (Tony Rojas), Camino Hall (Amanda Wolschleger) and the Student Support Services’ office (Tatiana Zamora) in Hahn University Center 113. 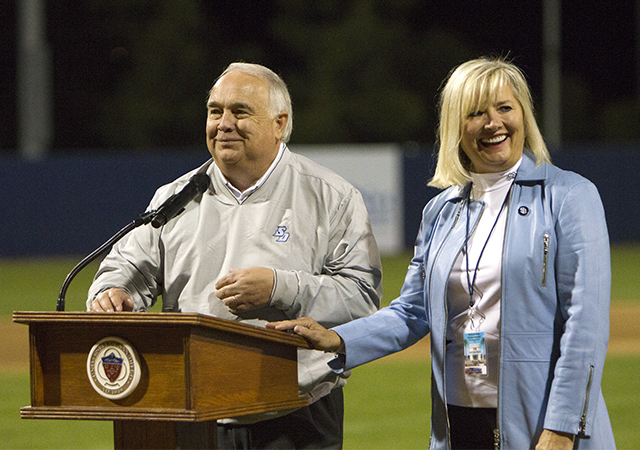 This event was supported by the Office of the Provost and USD’s Institute of College Initiatives. Photos by Ryan T. Blystone and West Coast Biological Sciences UR Conference Facebook page.